Strives to improve the overall health of Club members ages 6-18 by increasing their daily physical activity, teaching them good nutrition and helping them develop healthy relationships. In a world full of video games and fast food, it is important to instill a sense of well-being in our children. Triple Play teaches Club members about Healthy Habits, ways to eat healthy and live healthy. 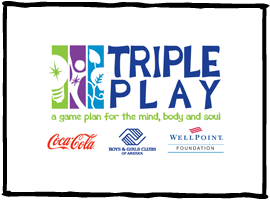 Want to participate in Triple Play? Or just have a question?